This reader parameter allows you select the feature types to read. You can set up an FME translation and run the workspace on a subset of the defined layers. Note: You can also do this by deleting or disabling unwanted feature types before running the workspace. However, this can sometimes mean editing and re-editing the workspace to return it to its original state. In the Navigator, expand the reader Parameters > Features to Read, and right-click on Feature Types to Read. Then click Modify Feature Types List. 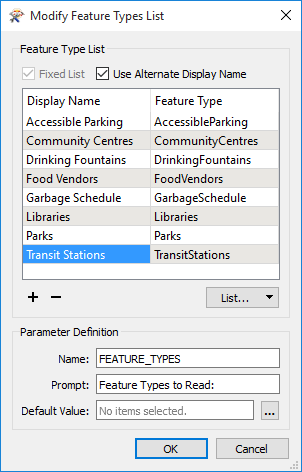 You can choose feature type names from a static list that is built from the feature types that already exist in the workspace for the given dataset. ( However, if you have previously chosen to Merge Feature Types, there may be only one feature type in the workspace.) If the value of this parameter is <not set>, then all feature types in the workspace will be read. Sort By Feature Type: Display the list in alphabetical order. Sort by Display Name (available only if you check Use Alternate Display Name for a published parameter): Display the list in alphabetical order by display name. Add from current dataset: Choose from existing feature types. You can add or remove names from the list. Workbench will only read the listed feature types. 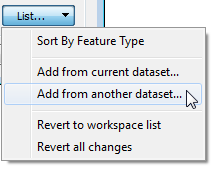 Add from another dataset: If you choose another dataset, you will be prompted to select it from a Specify Data Source dialog. When you press OK, you will be prompted to check the feature type(s) in the Feature Type List and click OK to accept the changes. Revert to workspace list: Clears all changes, and lists only the feature types in the current workspace. You can also use the +/- buttons to add or remove list items. 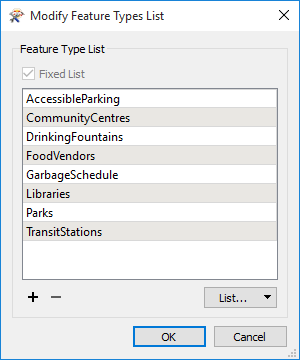 After you press OK, Workbench will build a new static list of Feature Types To Read. If entering Feature Types to Read manually, feature type names that contain spaces must be enclosed in double quotes. For example, "Bus Routes". 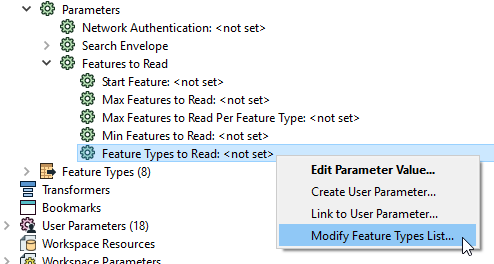 By publishing the parameter, you can select which features to read at run-time (for example, by a user who runs the workspace via an FME Server web page). Check the Use Alternate Display Name box to assign an alias to each feature type name. If you have a long list, this can make it easier to identify feature types at runtime. List: See above table for explanations of display options. Name: Change the name of the Published Parameter. Prompt: Enter the prompt to display at runtime. Default Value: If applicable, assign a default value for the parameter. You can always modify the list by right-clicking on the Published Parameter in the Navigator and selecting Modify Feature Types List.